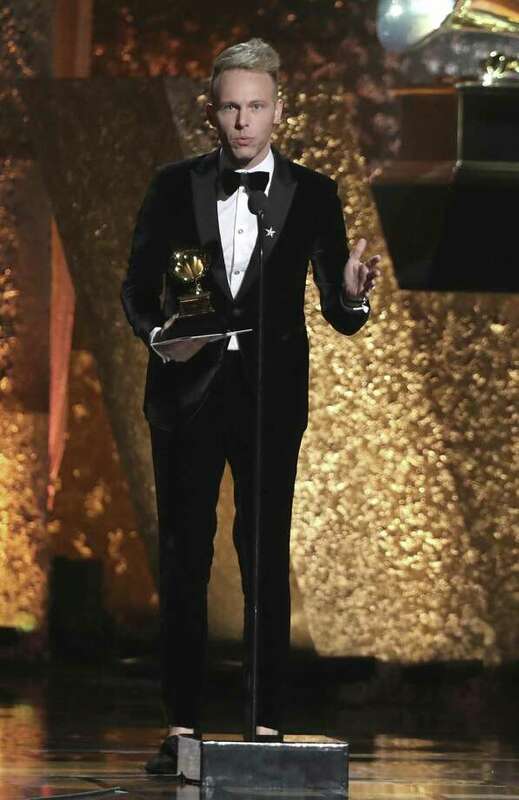 WESTPORT — Westport’s own Justin Paul won his second Grammy at Sunday’s award show. A Staples High School graduate, Paul, 34, took home the prize for Best Compilation Soundtrack for Visual Media with his songwriting partner Benj Pasek for their work on the 2017 film, “The Greatest Showman,” starring Hugh Jackman, Zac Efron and Zendaya. Paul and Pasek won a Best Musical Theater Album Grammy in 2018 for the cast recording of “Dear Evan Hansen,” a musical about young outsiders that has become one of the most popular theatre productions out today. Dear Evan Hansen also won Paul and Pasek six Tony awards in 2017, including best musical. The pair’s work on “La La Land” also brought them acclaim, not to mention an Oscar for their song “City of Stars,” the film’s signature ballad. While Paul is busy working and collecting accolades, he still finds time to return to Westport to cheer on the town’s current musical theater students. Last March he visited both Staples and Coleytown Middle School to to speak and sing with the kids. “I feel like now, at least here, there’s such a sense that there’s a future in the arts, and that wasn’t necessarily so much the case at that time,” Paul told those gathered in the Staples auditorium on March 9.